Additional stowage compartments are located in the sides of the luggage compartment. The side walls can be removed by pulling them up and out in the direction of the arrow . This enables you to stow larger items in the luggage compartment. In the door trims (front and rear). Pockets in the backrests of the front seats. 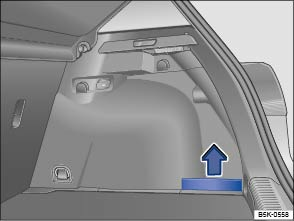 Stowage areas for light items of clothing behind the rear seat backrests. Coat hooks on the centre door pillar and on the rear roof grab handles. Bag hooks in the luggage compartment . Hanging up items of clothing can restrict the driver's field of vision and cause accidents and serious injuries. Always hang items of clothing in such a way that they do not restrict the driver's field of vision. The clothes hook in the vehicle should only be used for transporting light items of clothing. Never leave any heavy, hard or sharp objects in the pockets.